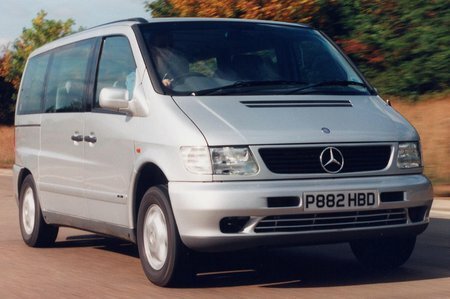 Used Mercedes V-Class Review - 1996-2004 | What Car? The phrase 'van with windows' to describe people carriers has never been more accurate than when applied to the Mercedes V-Class. Despite its appeal to the chauffeur-driven industry for groups of travelling executives, this is a Mercedes Vito van with extra glass in the body, six captain's chairs in three rows of two, and lots of luxury kit added. That includes electric everything, plus air suspension at the rear. MPVs aren't meant to be hurled around, but the sheer size and weight of the V-Class makes it unwieldy, even at low speed. The huge turning circle is a pain, too. To its credit, the cabin doesn't feel too van-like from behind the wheel: there's decent visibility and a good driving position. All models come with air-conditioning, and there's a host of options including folding tables and chromed coathangers.